Proanthocyanidins are the most abundant phenolic compounds and have been reported to exert anti-inflammatory actions. The aim of this study was to investigate the effects of grape seed proanthocyanidin extract (GSPE) in a mouse model of carrageenan-induced pleurisy. Following the induction of pleurisy using λ-carrageenan (Cg, 1 %), GSPE (25, 50 and 100 mg/kg) was administered per-oral (p.o. ), and the glucocorticoid-induced tumour necrosis factor receptor (GITR), IL-17A expressing cells and other markers, such as cytokines (Th1/Th2 and Th17), were studied. 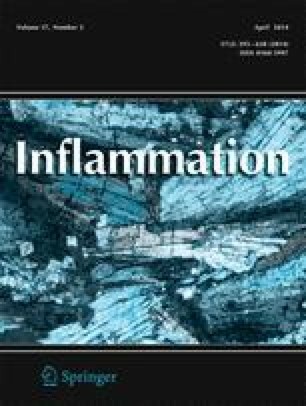 We evaluate the effects of GSPE on the mRNA expression of pro-inflammatory and anti-inflammatory mediators. The results illustrated that the cell numbers of IL-17A and GITR expressing cells and the cytokine levels in Th1/Th17 cells were markedly increased in the Cg-group, whereas the cytokines produced by Th2 cells were significantly decreased in the same group. Treatment with GSPE reversed these effects. Histological examinations revealed anti-inflammatory effects of GSPE. S.F. Ahmad and A.R.A. Abd-Allah contributed equally to this work. The authors are grateful to the College of Pharmacy Research Center and the Deanship of Scientific Research, King Saud University, Riyadh, Saudi Arabia, for the financial support.